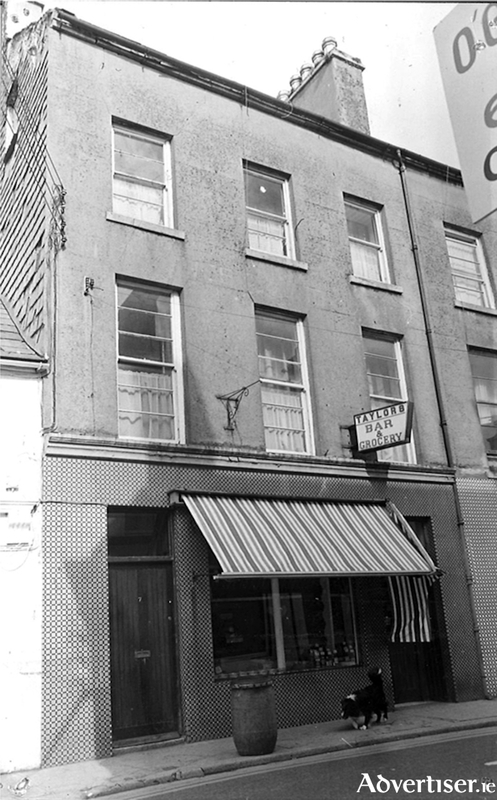 This late 19th century building in Upper Dominick Street was originally a grocery and a pub owned by a family of O’Connells. They used to stable horses out the back. When they sold it, they moved to Dublin where one of them was unfortunately murdered. The pub was taken over by a Mr Cosgrave. In 1950, Paddy Taylor, who had previously worked in Liptons, bought the building. He had been sent from Dublin to Galway for two weeks to help out in the shop here. The first night he was here, he met Vera FitzMaurice on O’Brien’s Bridge, she worked in a local butcher shop. He never went back to Dublin. In Dominick Street the grocery was out the front, and the bar in behind, and at the back there was a room where they played darts and a lot of cards. There was a granite counter in the bar and a timber one in the grocery. When he was cutting ham with a knife, he would occasionally take chunks out of the wood, and so he moved the granite counter out to the grocery and the wooden one into the bar. He specialised in bacon, and the canopy you see in the photograph was to shield the crúibins, the gluinins, the sides of bacon from the sun. The Taylor children spent much of Race Week cutting rashers for hotels and B&Bs. Later, he installed a big ham slicer on the counter. The pub had an early morning licence and could open at 9am. Among the regulars were Walter Regan, Bob Noone, and Jimmy Commins. and a lot of people from ‘the west’. A good number from Rahoon and Barna would turn up at the weekend for the cards. The pub also had a good darts team. It was a great GAA house and Paddy had the allocation for distributing tickets for forthcoming games in the stadium. This was done from his upstairs sitting room. He spent most Sunday afternoons doing the gate at games and he was a great supporter of the Western Stars street leagues teams in the 1950s. His other great passion was the West Clare Railway, about which he wrote a book. He died in 1980. His children ran the bar for a few years and then son Mick took over and the business became known as Mick Taylor’s. A whole new generation of characters became the regulars. It became a student pub. Mick kept an extensive collection of The New Yorker magazine there, so even if you were on your own, you would never be bored. There would often be three different ‘crowds’ there, one in the front, one in the middle, and the other at the back and in the beer garden. Sadly, Mick died in 1989. The pub closed in 2004 and the building was converted into a ‘gentleman’s club’. Happily that situation has now reversed and Taylor’s Bar reopened last weekend in all its former glory with its late 19th century shop interior with carved woodwork and polished granite counters intact. A visit to the pub will undoubtedly revive happy memories for many Galwegians. Page generated in 0.0902 seconds.